Where I can come to breathe. All I need is me. For the places they’ve helped me to go. Now is a time for slow. That they’ve helped me to walk so far. Now is a time for calm. For all the balls they’ve thrown. Now is just time for alone. For all that they’ve helped me to make. Now is their time for a break. For all that they’ve helped me to see. Now is just time for me. It was mid-afternoon. Both the kids were fed, rested, and happy. This, I thought, was a perfect opportunity to load them into the double pram and walk to the supermarket to pick up a few things that we needed. Except the toddler insisted on walking. That’s ok, I thought, if he wears himself out this afternoon it will make bedtime easier. It might take a bit longer but we’re all still happy so let’s go with it. He stopped to watch caterpillars, smell flowers, and walk along walls. It was turning out to be a delightful walk. Except the slow pace made the baby frustrated and want to get out of the pram too. That’s ok, I thought, I can carry her in one arm and push the pram with the other hand while we’re walking at this pace. Except then the toddler insisted on holding the hand that was being used to push the pram. That’s ok, I thought, I knew my body was holding onto that baby weight around my tummy for a reason. I can hold the baby in one arm, hold my toddler’s hand with the other, and push the pram along with my perfectly padded belly. It was not as easy as I imagined. The walk was becoming less delightful by the second. I was red faced and flustered, cursing my hubris with every step. My hair was blowing in my face but I didn’t have a spare hand to brush it back. One of my sneakers came untied. By the time we got to the shops all I could think about was finding a bench to stop at. I needed to get myself together. So when I saw the woman making a beeline towards me I tried to avoid eye contact. But this one was not for turning. “Oh aren’t they precious,” She gushed. “It goes so fast. Make sure you enjoy every minute.” There it was. 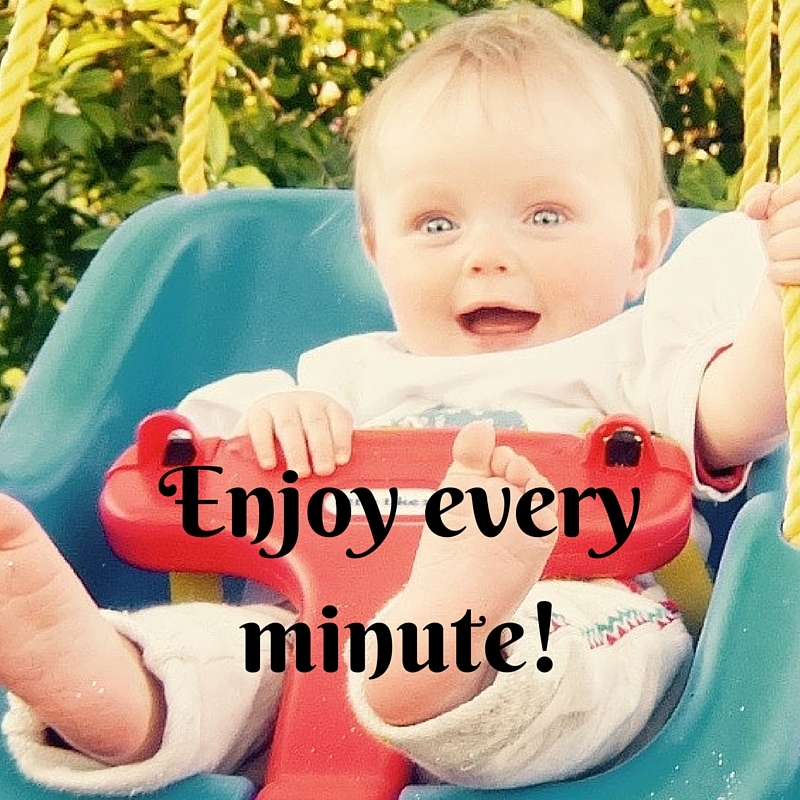 Enjoy every minute. Then again when I had a newborn. Cards and messages, friends and well-meaning strangers were all telling me to enjoy every minute. When I was so tired that I forgot that I was sterilising my breast pump in boiling water, only realising when I smelled the melting plastic (a smell that lingered on for days), I wanted to scream “What about this minute? !” When I had mastitis and couldn’t get out of bed. “What about this minute? !” When my baby was screaming and I couldn’t figure out why. “What about this minute? !” Sure he’s the greatest thing ever in the history of the entire universe but what about this minute and this minute and this minute?!? Of course, people don’t actually mean that they think that you will, or even should, enjoy every minute. They just want to emphasise that time goes by so fast and that children grow up before you know it. The thing is, when people keep telling you something over and over you really start to believe it. Then when you are not in fact enjoying every minute you begin to question yourself. This is the fourteenth nappy I’ve changed today, I’m getting a bit over it. No, no, wait, I should be appreciating this moment, one day I won’t have any nappies to change. My toddler’s been pinching me incessantly while I’ve been trying to cook dinner. I should relish the pinching now because when he’s all grown up there’ll be no one to pinch me while I chop carrots. I’ve got a headache this morning, I’d love nothing more than just to go back to bed. Hang on now, I should embrace the tiredness, one day I’ll get all the sleep I want and wish for nothing more than a return of that extreme fatigue. Not enjoying every minute – one more thing to add to the list of things that makes me a terrible person. Worst advice ever. On the other hand, when taken as it is intended it really is the best advice. I do try to remember it during the rough times because I know that most of the these parenting-young-children times are good times. More than good. That crazy, indescribable soaring of the heart wonder. I know I’ll miss so very much about this time. One day maybe I’ll even genuinely miss everything about this time. I have no doubt that many of the people who give me this worst best advice are in fact missing everything about this time in their own lives. So I looked at the kindly, well-meaning woman at the shops who was looking at my children but seeing her own, smiled and said: “Thank you. I will.” Then I thrust my belly back out and pushed the pram away from her as fast as I could.